When people talk about “Montrose” or “3rd ward” I always wonder if these are in any way “official”. Meaning, if someone is arguing about where 3rd ward ends, is there a go-to place that give the final word on where these boundaries are? Or is a matter of locating a 100 year old map and saying that’s the one that’s right vs. someone else using some other data point? @Cody: I guess technically, the wards would have stopped at the 1905 city limits (the wards were officially abolished in that year). But that means much of what we call “wards” today doesn’t fall in those technical boundaries — the 1905 version of Third Ward, for example, includes what we’d now call Downtown, Midtown and EaDo, but not our modern-day concept of Third Ward. It’s kind of cool to think of designations that officially became obsolete 114 years ago are still around and have changed as the city has grown. Thanks for correcting this guys! Its a good case study. Despite being a dated way to group our city, it is baked into our history, and now embraced with pride in both First and 6th Wards. This is an old conversation about what was First and Sixth Wards and what is First and Sixth today on maps and the TIRZ complicated the debate. I can assure you First and Sixth are all part of SN22. Working together is a more productive path to achieve livibility and sustainable goals along with district growth. Happy 2019 to both districts, and this First Ward resident is very happy this church won! The preservation of culture in the face of gentrification is an uphill climb! 1: Little White Oak Bayou on the East, the projection of Congress St (until it crosses White Oak Bayou) and White Oak Bayou on the South. 6: The projection of Congress St (until it crosses White Oak Bayou) and White Oak Bayou on the North, Buffalo Bayou on the South. In modern usage, 2nd ward is generally used to refer to that part of the East End not quite close enough to downtown to be in EaDo; the 4th ward refers to the area south of Buffalo bayou too far East to be Montrose and too far North to be Midtown; the 1st Ward is those few blocks across I-10 from Woodland Heights; and the 6th ward is the lower end of the Washington corridor. @ Cody: The wards are no longer governmentally official, but they are geographically real. To answer your question “is there a go-to place that give the final word on where these boundaries are?”—the answer is not always, and the reason is Houston’s changing size and form. Montrose didn’t exist when the wards were created, much less Meyerland or Kingwood. But in the case of the location of that church and the wards system, there is an unambiguous rule that applies because Houston was, at one point, defined according to a 3-mile radius centered on Congress and Main, and it was divided up into wards with boundaries running along those streets. In this case, there is no “someone else using some other data point,” unless it’s a personal opinion. Cody: There are no neighborhood name police. Everything changes. Someday this will all be Tampico Heights. Some years ago, Rice University offered a 6-week course in their continuing education department that covered the history of the wards, one per week. It was fascinating, and unfortunately, I can’t lay my hand on the material. Perhaps it’s floating around somewhere; the Julia Ideson Library comes to mind. But the Wards were abolished in 1905, so why look at maps from 1913 or 1920? Went looking for original legal documents detailing boundaries of the wards without out luck on Google. @Cody; The Super Neighborhood Boundaries have city defined boundaries: https://www.houstontx.gov/superneighborhoods/snmapsbyzip.pdf The city has defined a boundary for Neartown – Montrose (SN #24) and Greater Third Ward (SN #67). @ Robert Rutherford: the link below is to the 1895 Whitty & Stott map of Houston, which shows the same ward boundaries as the 1913 and 1920 maps. As 6th Ward Guy mentioned, a lot of sources from recents years (Chronicle articles, webpages, Texas Handbook) have pushed the 1st Ward all the way down to Washington Avenue, and I reckon that realtors, other businesses, and TIRZ’s can do the same if they want. That said, the original boundaries bear out what 6th Ward Guy said. 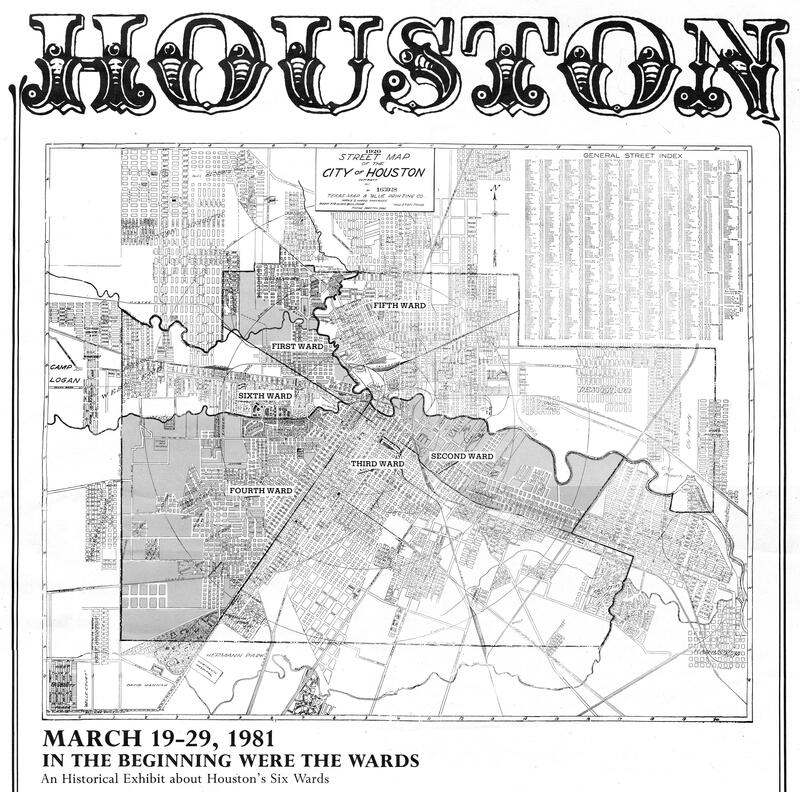 What many consider Sixth Ward now is defined by the map of the Old Sixth Ward Protected Historic District(listed here: https://www.houstontx.gov/planning/HistoricPres/HistoricPreservationManual/docs_pdfs/Old_Sixth_Ward_MAP.pdf). The NA, TIRZ, SN, and other ‘older’ city maps have different boundaries with respect to each other.